In the case of elastic outer ring, the input of loading is changed. Instead of the load onto the inner ring, the load on the outer ring can be defined on several points. It is not possible to define displacements or rotations directly. An angle, axial and radial positions define the point where the load is acting. The load can be defined in axial, radial and tangential direction. Since the overall torque has to be zero, an input of tangential load can only be used if several loads are defined. The coordinate system is a standard cylindrical coordinate system with r-direction pointing to the outside. Therefore, Fr should usually be entered as negative value for pressure. The axial position can be used if you assume that the radial load is not centric. An eccentrical load leads to torsion of the outer ring. The first rolling element on the y-axis is at an angle of zero. 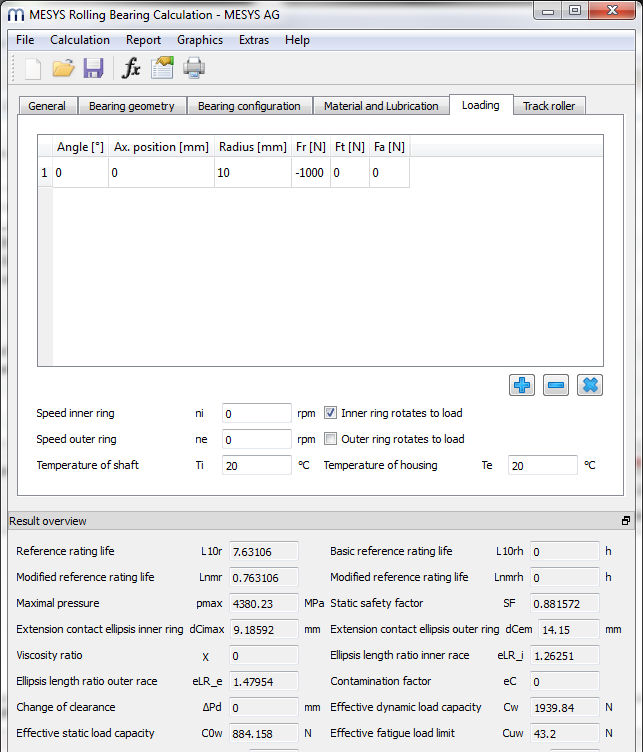 The results will be different if the load is applied on the position of a rolling element or between them. Both cases should be considered in doubt.